If you will be using elementary and secondary grading periods, set up all elementary grading periods first. Not doing so, could cause issues with elementary report cards. 1. Click Grades, select Grading Periods, click Add. 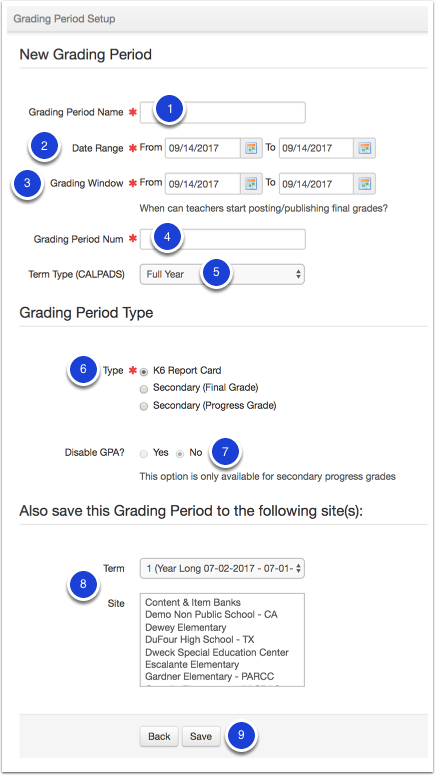 When needed to change or edit Grading Periods, they can only be edited individually at the site level. If all Grading Periods were built at the district level, edit both the district and the site to keep information consistent. 3. Edit the information as appropriate, as learned in Create Grading Periods.